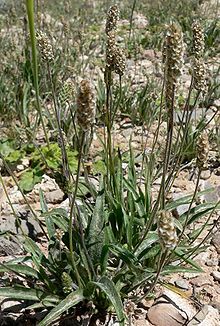 Plantago ovata, known by many common names including blond plantain, desert Indianwheat, blond psyllium, and ispaghul, is a medicinal plant native to Western Asia and Southern Asia. The plant can be found growing wild in the southwestern United States, where it is considered a possibly introduced species. It is a common source of psyllium, a type of dietary fiber. Psyllium seed husks are indigestible and are a source of soluble fiber which may be fermented into butyrate – a pharmacologically active short-chain fatty acid – by butyrate-producing bacteria..
^ Medlineplus. Blond psyllium (a.k.a. Plantago ovata). Effectiveness, interactions with medications, etc. ^ Fernández-Bañares F, Hinojosa J, Sánchez-Lombraña JL, Navarro E, Martínez-Salmerón JF, García-Pugés A, González-Huix F, Riera J, González-Lara V, Domínguez-Abascal F, Giné JJ, Moles J, Gomollón F, Gassull MA (1999). "Randomized clinical trial of Plantago ovata seeds (dietary fiber) as compared with mesalamine in maintaining remission in ulcerative colitis. Spanish Group for the Study of Crohn's Disease and Ulcerative Colitis (GETECCU)". Am. J. Gastroenterol. 94 (2): 427–33. doi:10.1016/s0002-9270(98)00753-9. PMID 10022641. Wikimedia Commons has media related to Plantago ovata. This page was last edited on 27 February 2019, at 21:28 (UTC).